After the Second World War, distribution of personal income in New Zealand became increasingly more equal. But from the mid-1980s income became less equally distributed. In 2009 almost half of New Zealand’s wealth was owned by the richest 10% of households. Economists use a number of ways to work out how income is distributed in New Zealand. In New Zealand after the Second World War, the share of money earned by labour (as wages and salaries) grew, and the share earned by capital fell. But the share earned by capital grew again in the 1980s and 1990s. In 2006 half of the population earned only about one-sixth of all income. But the top 20% of earners made more than half of all income. 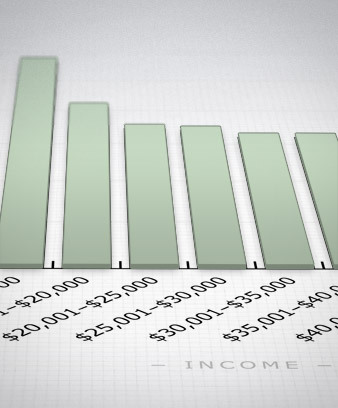 The average income was $32,500, but the median (the middle, with half the people above and half below) was only $24,500. Some people, such as school students or stay-at-home parents, had no income or very low incomes. From 1951 to 1981, personal income distribution became more equal. One reason was that more women were working and making money. However, after the mid-1980s income distribution became less equal again, especially after benefit cuts in 1991. In 2006 men earned about 60% of total income, and women earned 40%. This is because women are less likely to be in the paid workforce, and more likely to work part-time or in lower-paid jobs. People are more likely to have low incomes in their teens and early 20s, when many are still studying. High incomes are more typical of people aged 25–60 – although women earn less or nothing if they stop work to have children. As people get older and retire, their income drops. In the 2006 census people who identified themselves as New Zealanders or Europeans had the highest incomes. Asians had the lowest incomes – probably because many are students. Māori earned less than Pākehā. The gap between Māori and Pākehā narrowed after the Second World War, but slowly. Wealth is the assets a person owns (like houses, cars, savings and investments) minus their debts. For most households, the house they live in is their most important asset. In 2001 property made up more than half of all household wealth. Wealth is more unequally distributed than income. In 2001 the top 10% of households owned almost half of all wealth – on average $1 million each. The bottom 20% of households had little or no wealth, and some were in debt.